To free his father from the witch-queen of the Dark Isle, Falcon must find the legendary Light of Valmora that lies hidden in the darkest place on earth—right under the witch’s feet. To complicate things further, he is falling in love with Izabelle, the Gypsy woman who loves his brother, Peregrine. Izabelle struggles with her feelings for her first love, Peregrine, and her growing affection for his brother, Falcon, but time is running out and the price of Valmora’s salvation may be the sacrifice of its greatest warrior and Izabelle’s last chance for love. She loved Peregrine. She had given her heart to Falcon's brother even though Peregrine did not love her in return. Surely, she was not this capricious that any man's touch could send her into this heat. If only Peregrine would touch her the way Falcon did. If he would only graze his fingers over her skin caressing her as he did his violin the way that Falcon did at this moment. Peregrine hurt her when, instantly upon obtaining assurance that she was unharmed after the attack, he rushed off to join the others in celebration. Didn't he realize she wasn't fine, that she was afraid and shaken by the attack? Couldn't he sense the way his brother did that she needed to be held, touched, and sheltered by him? Something shifted inside Izabelle causing her emotions to wage their own war inside her, until fear changed to anger. How dare Peregrine ignore her this way? She took the key from Falcon's hand and slipped it beneath her bodice. "No. I must keep the key. My father entrusted it into my care and the key is my duty and my destiny. I alone must carry it. I am not afraid," she lied. Falcon withdrew his hand and stepped back from her. She missed the warmth of him immediately. Venturing a glance at his face, she noticed the color had returned and his eyes became guarded once again. "As you wish," he said with frosty indifference. "I'll leave you to your solitude. I'd like to find out more about this Thomas guy and join the others for a drink or two. You shouldn't stay here alone for long. No telling when another of Mahara's clan might find you." "I'll be along in a few minutes. I want to wash my face and see to my horse first." Her throat ached where words, tender and unspoken, coagulated. Falcon turned his back to her. She watched him as he walked away from her with his back straight and his shoulders tense. A chill run down her spine and a cloud moved over her spirit. Something dark awaited Falcon's future, something no one could prevent. Her heart wrenched in dark foreboding. Death cast its shadow over him. 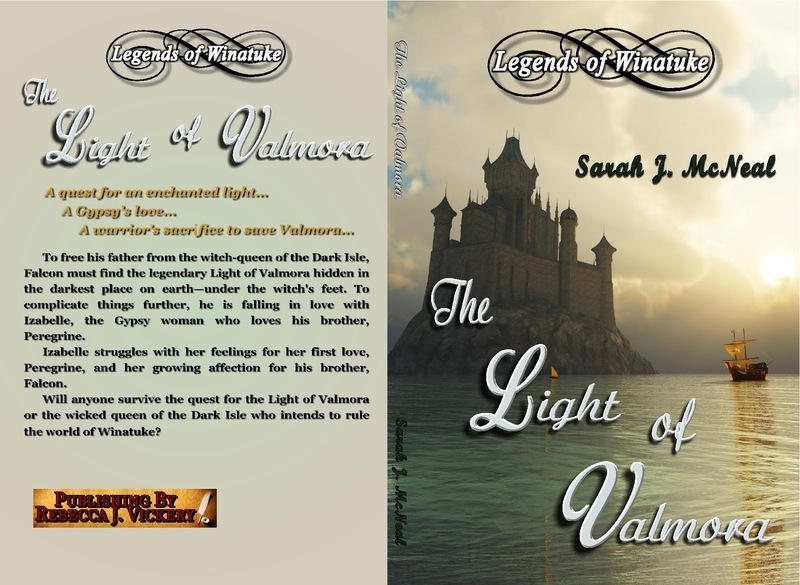 The Light of Valmora launches my new paranormal series, Legends of Winatuke. The first two novels in the series, The Dark Isle and The Lake of Sorrows, are presently in edits and will be available in the near future for only $.99 each. 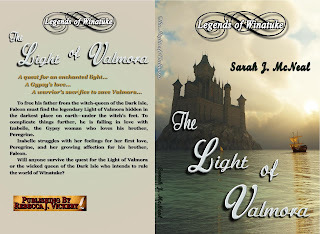 You could win a digital copy of my new release, The Light of Valmora, by leaving a comment and your email address in your comment. I will announce the winner on Valentine's Day, February 14.